Who Put the T in Texas? Fabulously friendly people, great fiddle music, respect for tradition, sessions into the night, deep community spirit, slower life style, scorching heat. West of Ireland, right? No (maybe the weather comment was a giveaway). It was Llano, Texas, population 3,232. Yay! Musical road trip to deep in the heart of Texas! 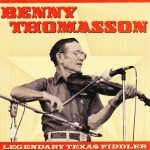 I’ve always had a bit of a furtive Texas fiddle fetish, starting with the Bob Wills references of the hippest band of my Birmingham youth, Ricky Cool and the Icebergs, and a couple of decades later a fun time at Johnny Gimble’s Texas fiddle camp, but recently the gentle musical explorations of the Jersey fiddle group Four Fiddles Count ‘Em and the burgeoning Americana scene in Jersey City led me to a Benny Thomasson record. The first lesson was such an epiphany moment that in a film would deserve a close up of a needle dropping onto a spinning disk (I made do with a click on a plastic mouse). And every track was like that, a new experience. The greatest thing though is that for all the technique and nuance of expression, you got the sense that this was man having fun with his music; you could have just wandered into his back room listening him play for himself.